Six marker buoys have been installed to mark the boundaries of a permanent exclusion zone that came into effect on Monday 15th August 2011. No 1. 35 degrees 05′ 48.05″ S, 138 degrees 28′ 21.11″ E. Flashing Yellow every 3 secs. No 2. 35 degrees 05′ 39.75″ S, 138 degrees 28′ 07.53″ E Flashing Yellow (2) every 10 secs. No 3. 35 degrees 05′ 31.45″ S, 138 degrees 27′ 59.95″ E. Flashing Yellow every 5 secs. No 4. 35 degrees 05′ 15.83″ S, 138 degrees 28′ 08.08″ E. Flashing Yellow every 5 secs. No 5. 35 degrees 05′ 24.13″ S, 138 degrees 28′ 21.65″ E. Flashing Yellow (2) every 10 secs. No 6. 35 degrees 05′ 32.43″ S, 138 degrees 28′ 35.23″ E. Flashing Yellow every 3 secs. The south east boundary of the zone will be approximately 500 meters off the shore from the Adelaide Desalination Plant site providing a channel to allow smaller vessels to pass between the coastline and the exclusion zone. 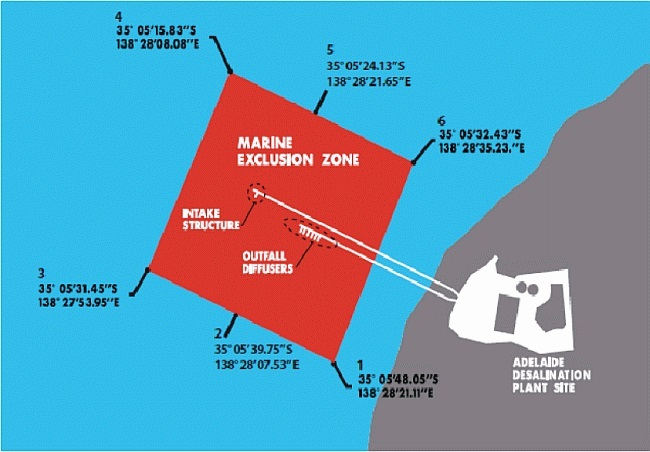 The permanent exclusion zone is in place to ensure the safety of all mariners in this area and to protect the marine monitoring equipment and the intake and outfall structures located within the boundaries of the exclusion zone. Unauthorised vessels and persons are prohibited from entering the area at all times. The exception to this permanent exclusion zone will be for vessels that are used for the maintenance of the intake and outfall infrastructure, the marine monitoring equipment or the navigational aids; and for vessels used to undertake marine monitoring activities. A Notice to Mariners will be issued confirming the permanent exclusion zone and signage will be in place at boat ramps to inform mariners of the permanent exclusion zone. If you would like to receive any further information about these activities please contact the Project Information Line on 1800 812 362, email the project team at desalination@sawater.com.au or log onto the SA Water website www.sawater.com.au.